Melbourne. Friday February 8th and Saturday February 9th. Tutor Erin Hill. The day dawned and we checked the Melbourne skies on Friday morning. All looked blue and bright, so we could easily cross the 2 streets to David Jones Bourke Street and up to the 4th floor where I would spend a good part of the next 2 days. 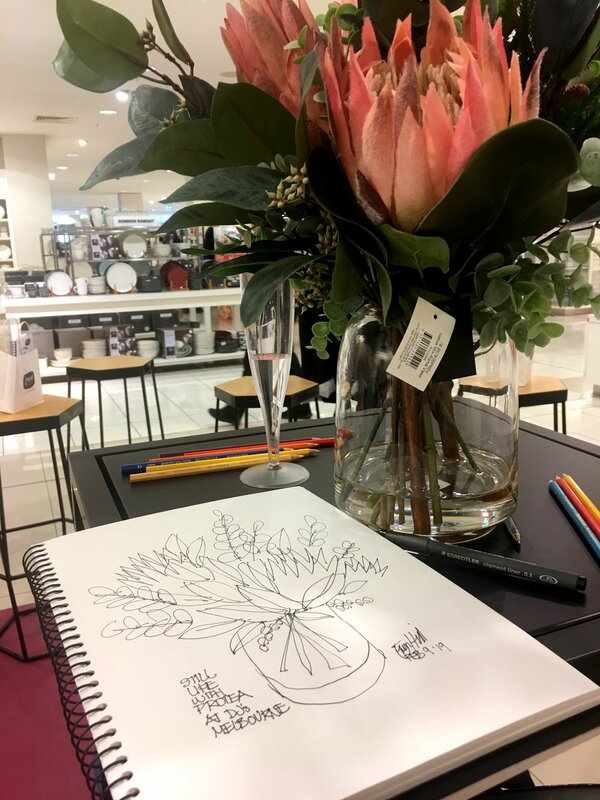 Very efficient staff had the magnificent protea flower still life waiting. 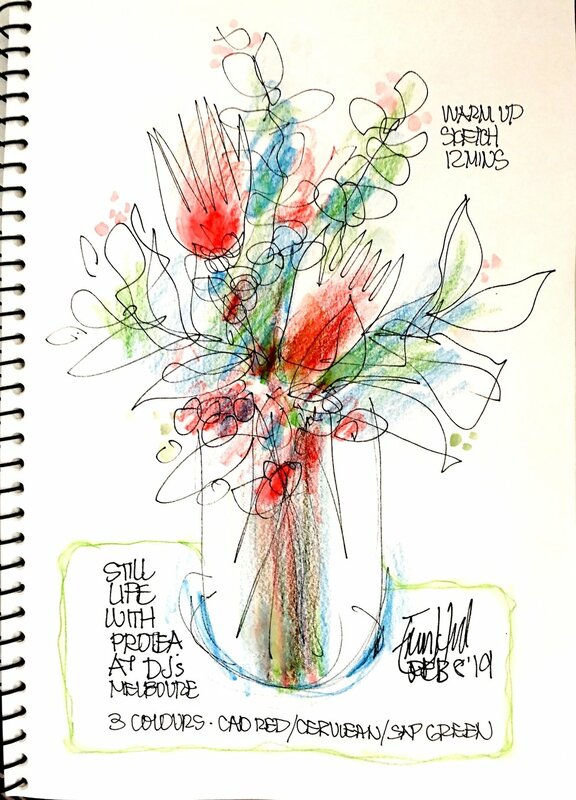 Stools were arranged in a semi circle, sketch kits waiting and of course champagne on ice. 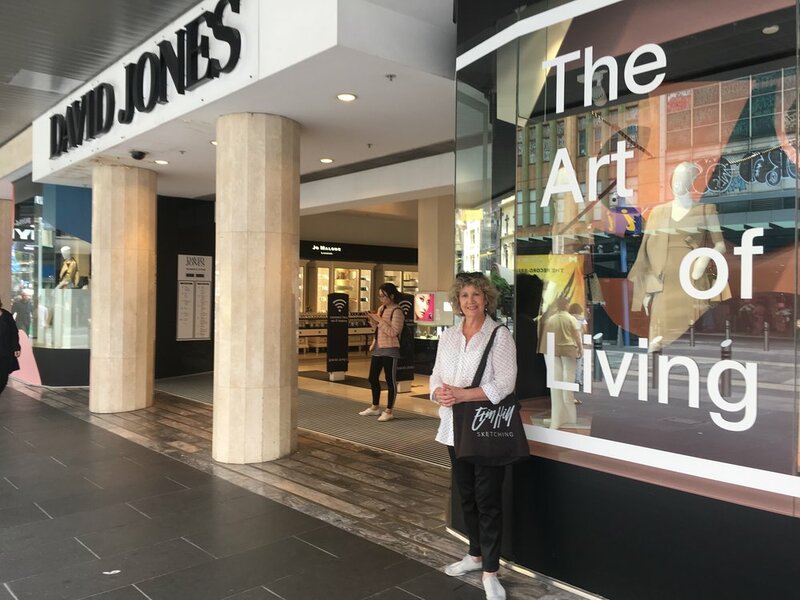 This was The Art of Living Autumn/Winter promotion for David Jones in Sydney and Melbourne. I would be the sketch tutor in Melbourne and Donna would be in Market St Sydney. 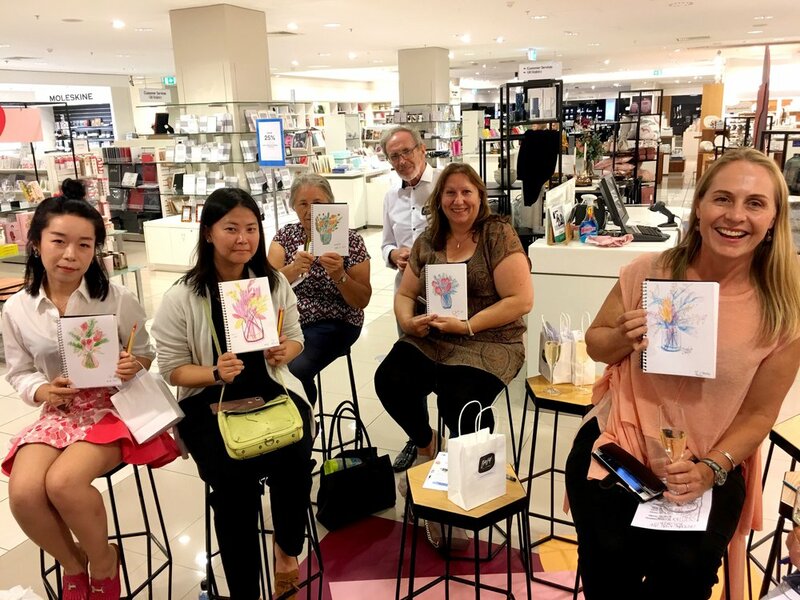 Guests who would attend the 30 minute Sketch and Sip sessions were customers of David Jones Department Store. 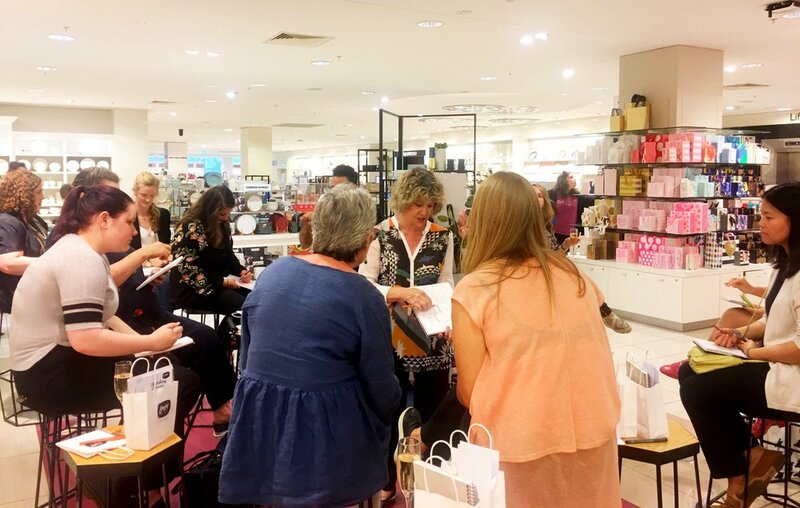 Every guest received a gift bag with sketch kit and promo leaflets , everything they’d need to get started. As each group arrived we’d introduce each one to help get to know everyone. Of course people are a little unsure about trying something new. Somehow a little Proseco helps loosen up that nervous pen. Very quickly I would explain that the world is all shapes and we’d soon be looking for them. Before they knew it the first flower would be there on the page in black pen. Then the next and the next. Now for the spikey leaves, and some classic leaf shapes. Let’s toss a few small leaves around too. Lastly the vase, some stalks and that’s it. Sign and date and give it a title to create your story. With 3 aquarelle pencils in assorted colours, we threw some colour on and watched the sketch come to life. 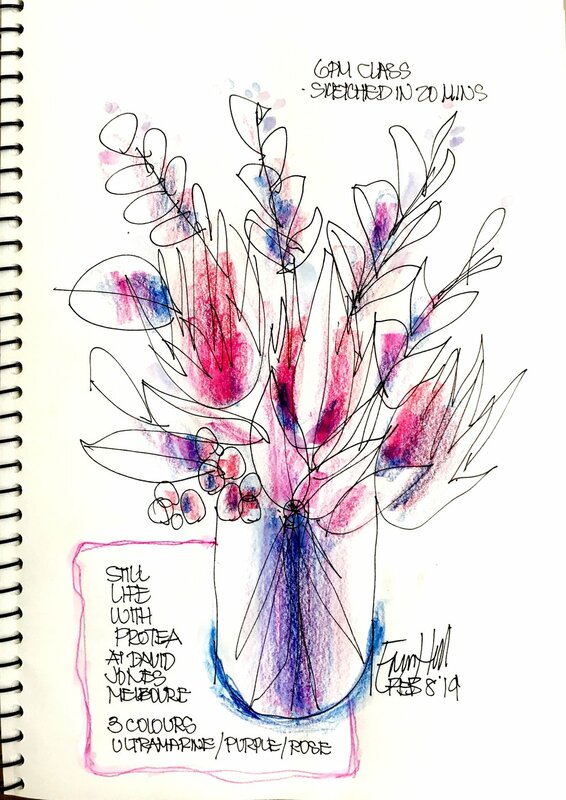 A simple impression and an absolute thrill to have a sketch you’ve created in your own style. The lovely thing was how everyone stayed after the sketch was done and chatted. Some arranged meet ups and others swapped emails. Sketching is like that. It brings out the best in people. Hopefully everyone will carry on sketching now that they’ve been bitten by the bug. Saturday groups with their first sketches…. 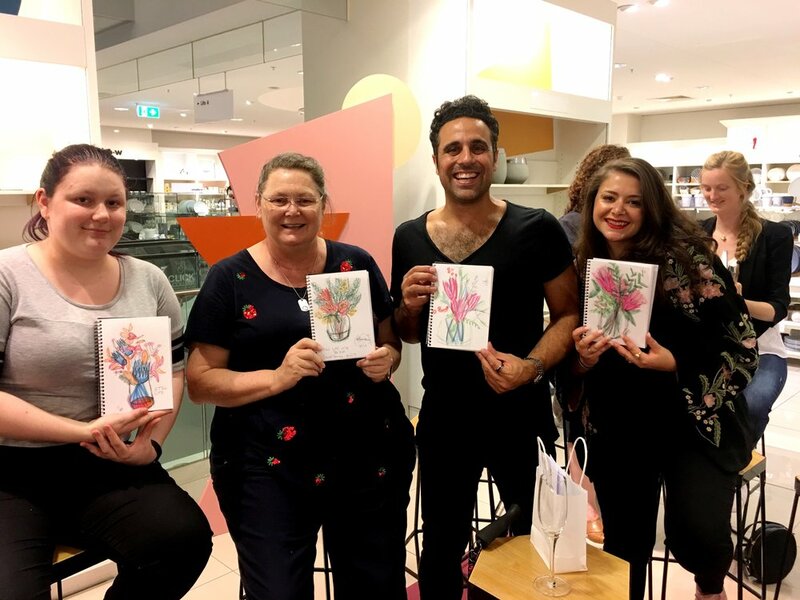 Now for David Jones Saturday at Market Street Sydney…. Saturday February 9th at David Jones Dept Store, Market St, Sydney. Tutor Donna Draper. Saturday started mid morning for Donna our tutor assisted by Tammy and Kirsten. Their still life setup was flower pot and champagne and pomegranate. 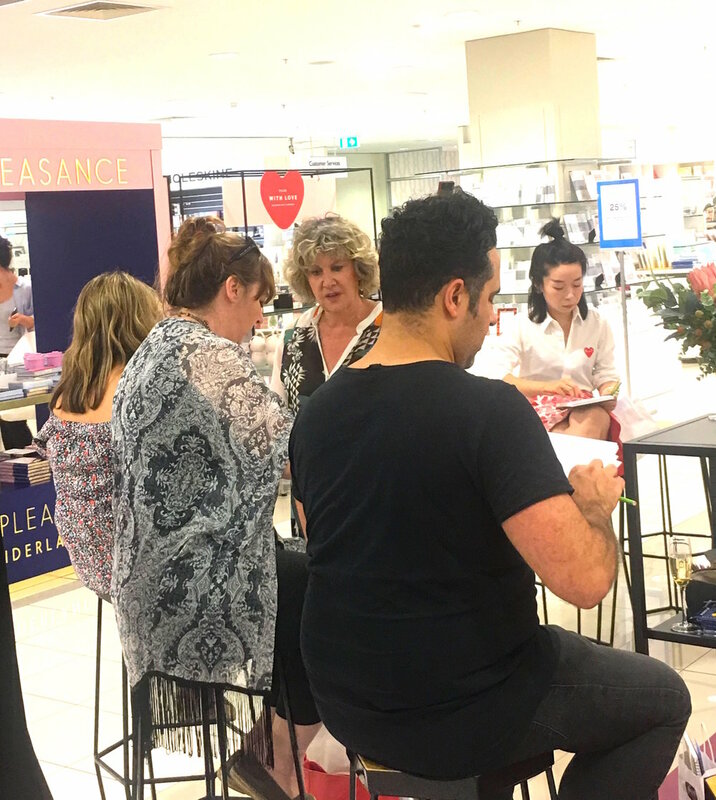 The guests were very enthusiastic and followed the demo Donna was showing step by step. Somehow champagne at 11am seemed perfectly fine and no one minded at all. One guest had her 8 yr old daughter with her who also joined in the sketching session. You won’t know which is hers. A very clever little artist. 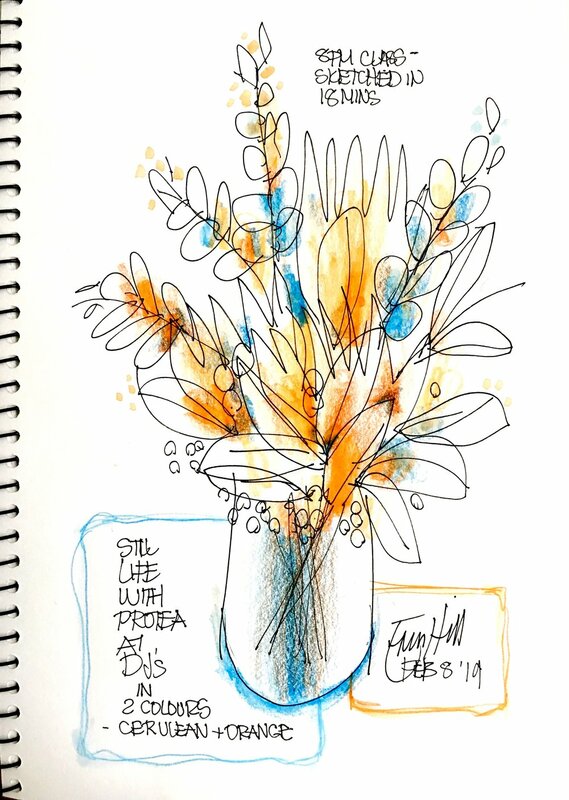 Once again very guest was delighted to have a chance to try travel sketching courtesy of David Jones Dept store and Erin Hill Sketching. We were delighted to be the invited tutors and would love to see everyone continue their new found skill. The world seems a nicer place when one sketches.